Canine Command ™ LLC, is a full service training facility, specializing in importing quality working dogs and training police K9's. We train narcotic detection K9’s, explosive detection K9’s, tracking K9’s and cell phone detection K9’s. Our goal is to produce the highest quality police dogs available for law enforcement today, while training each canine team to its highest level possible in the criminal patrol and detection, police K9 training process. Canine Command LLC is owned and operated by W. Dean Hunter, a Nationally Certified Trainer and Judge with thirty three years of law enforcement experience and over twenty seven years experience in handling and training police dogs. Dean has worked the streets as a criminal patrol / detection K9 handler and trained police K9's for one of the top 25 largest cities in the United States. Over the past twenty five years, Dean has overseen the purchase of green dogs, criminal patrol, narcotic detection, explosive detection and maintenance training for a Canine Section averaging 25 to 30 K9 teams. With this experience and understanding, Canine Command LLC has learned every handler and dog is unique. This knowledge has helped Canine Command LLC devise training and handling techniques fitting each canine team’s individual needs. As trainers, we work one on one with each canine team to obtain high quality, reliable police dogs and handlers. Canine Command LLC does not purchase or import titled (Schutzhund titled, KNVP titled, and etc.) dogs and sell them to law enforcement agencies as police K9s. 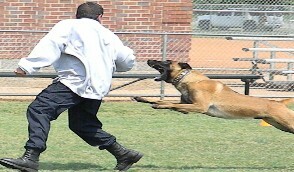 Canine Command LLC will only purchase and import untrained young dogs which are selected for serious police K9 training. Our dogs will not leave our facility until the handler has complete confidence his K9 partner will protect him and/or detect the odors he has been trained to detect. We also understand and stress the importance of proper record keeping for court testimony. Canine Command LLC is dedicated to making the training enjoyable and rewarding for both the dog and the handler. This approach to training results in the highest quality canine teams, and ensures their success. Call Canine Command LLC today at (615) 498-4268 and let us assist you with your next K9 purchase.